President and CEO Gianfranco Lanci unveiled the tablet prototype. Image credit: Shufflegazine. It runs Google's Android operating system, has a 7-inch display a keypad . Acer didn't reveal when the tablet will be released or how much it will cost. Acer's LumiRead is closer to market. The e-reader weighs 290 grams, has a 6-inch e-ink display and a barcode scanner that can read the ISBN numbers from physical books to search online bookstores or to make wish lists. 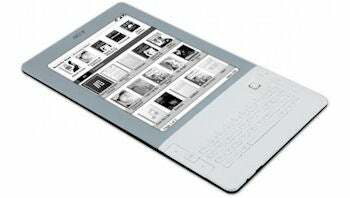 It can connect to Wi-Fi and 3G networks, and has an Internet browser and the ability to convert Web content into an e-book format. It will also share e-books and audiobooks with other Acer devices and computers through the company's new clear.fi system, which is based on the DLNA (Digital Living Network Alliance) home networking standard.